This beauty was only $10. It looked so heavy and masculine before, but now it’s soft and pretty! 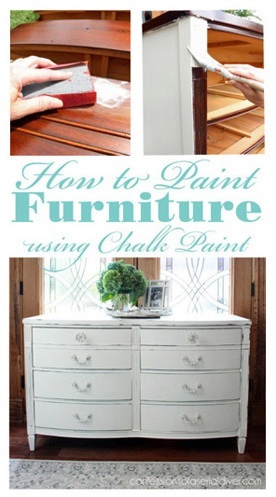 I started out by painting the entire piece in Behr’s Gray Morning that I made into DIY Chalk paint. This is an almost perfect match for Duck Egg blue. I knew just what I wanted to do. I originally wanted to paint a clock face on the top, but after more than two hours of trying to get that right, I scrapped that idea. Plan B: How about white stripes for the top? They were also not meant to be. They just didn’t look right…so I painted the entire top white, over the blue. What should have been a two or three hour project max turned into an all day affair! I have to say that although two attempts to create a unique table failed, I am very pleased with the end result. I always say if you get stumped on a piece, just start painting. The ideas will work themselves out. Notice anything new and beautiful? (ahem hardwood floors cough) I still have to finish the trim off with quarter round, but I am so loving them!! I can’t wait to share my whole space. (Tour coming in June woohoo!) This is my entryway. 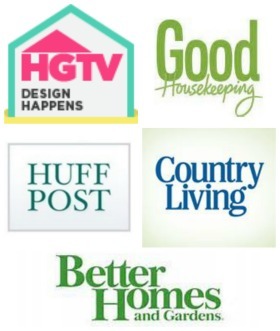 Update: See my Summer Home Tour now! 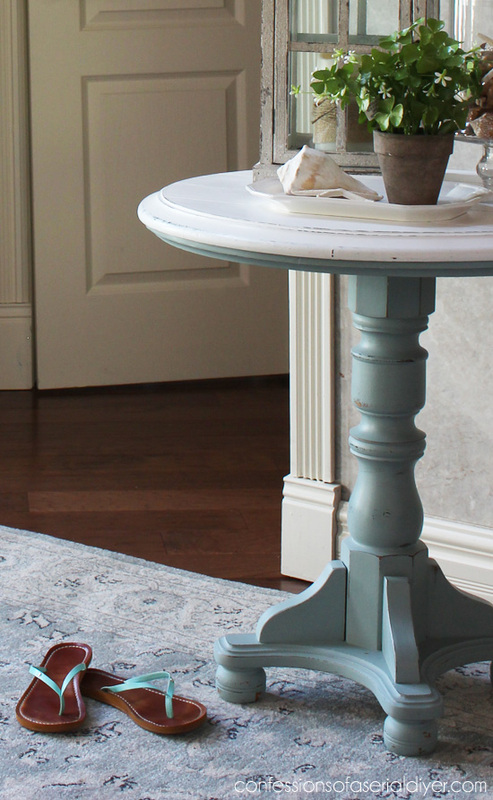 And this little table looks perfect with my new rug! I was planning on putting this in my shop but it does look pretty there! I finished it off with clear soft wax to seal. 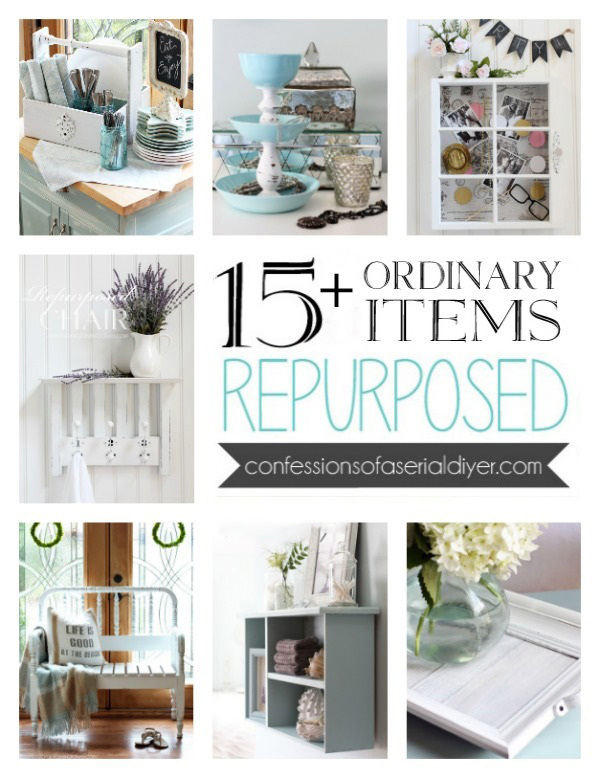 Want more small table makeover inspiration? Check out my friends’ tables below! P.S. 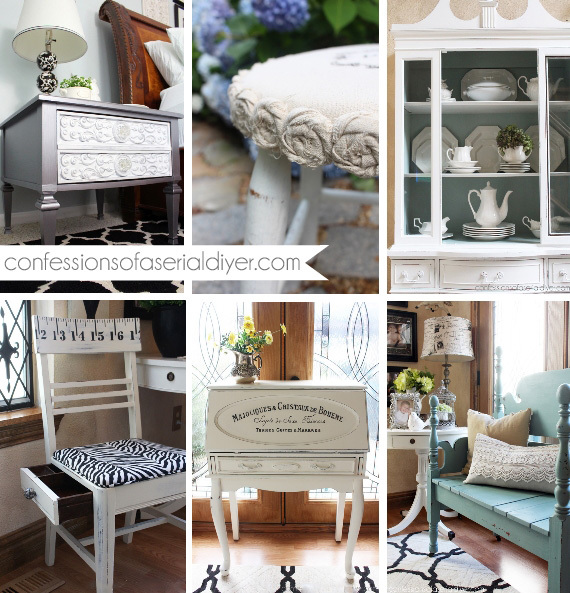 Here are some of my favorite Themed Furniture Thursday pieces from the past! Love everything you do!! 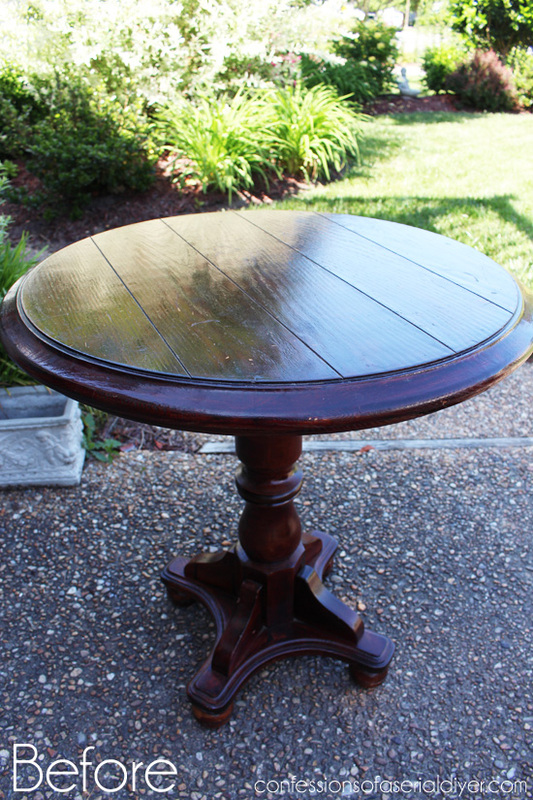 This table is perfect! As you say, you have an idea in your head but it doesn’t always work out! BUT you always find a way! 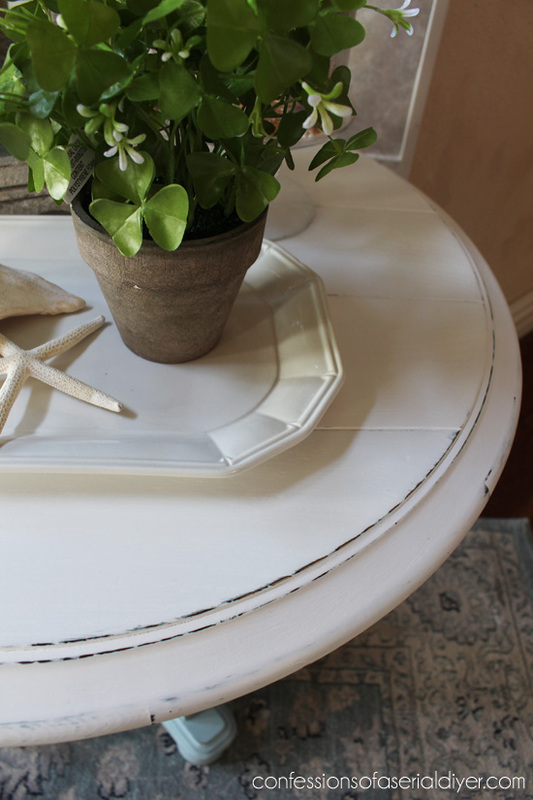 With as shiny as the surface was, did you sand it at all or go straight to your chalk paint? thanks for the great tutorial and tips!!! Love it!! And your floors!!! Wish I lived closer to the ocean. Love the coastal look but in Lexington it kind of looks out of place I think. Like you, I like the blue peaking out below the white paint. You got a great bargain on this piece. I need to get out to some yard sales. Your hardwood floors look great. I look forward to seeing more of them on your June tour. I am in love with this little table. I believe you should send it to me because it works perfectly with my decor. Let me know if you need my address. You have chosen a perfect spot to show it off. Job well done. 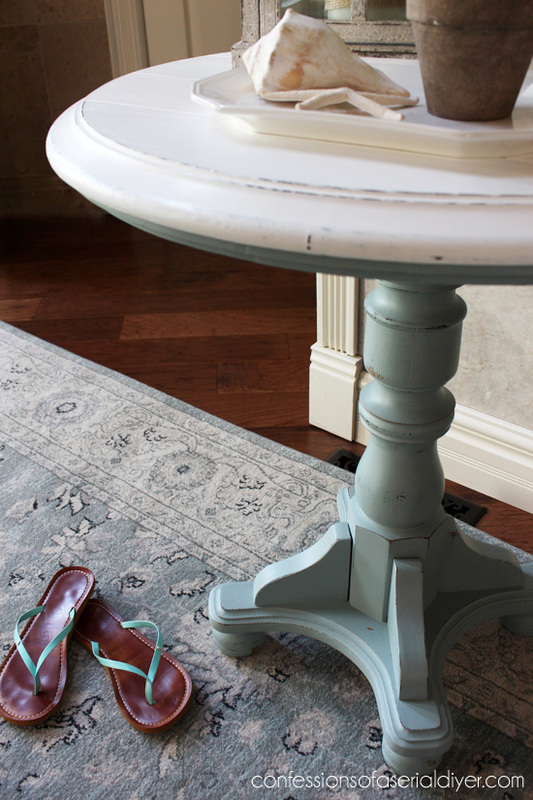 Love all of it, the table, floors and that rug! Can you tell me where you got it? 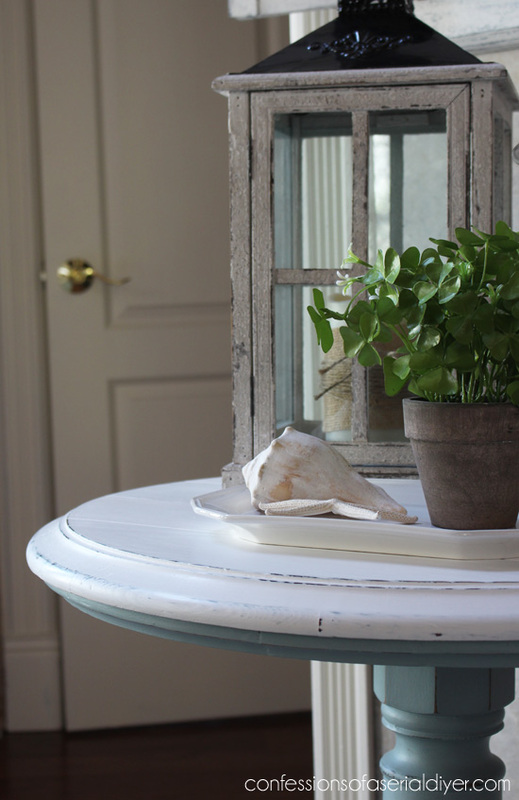 Also, if I do chalk paint on a bathroom cabinet, can I seal with polyacrylic instead of wax? thanks! This looks 100% better. It was so dark and depressing and now it looks light and happy. I love it right where you have it place. It looks gorgeous! Nice job as always! Thank you, Heather! It sure was dark and depressing wasn’t it? Now its light and soft…much better! Awe these pieces do have a mind of their own sometimes but most often the results are far better than we had envisioned. 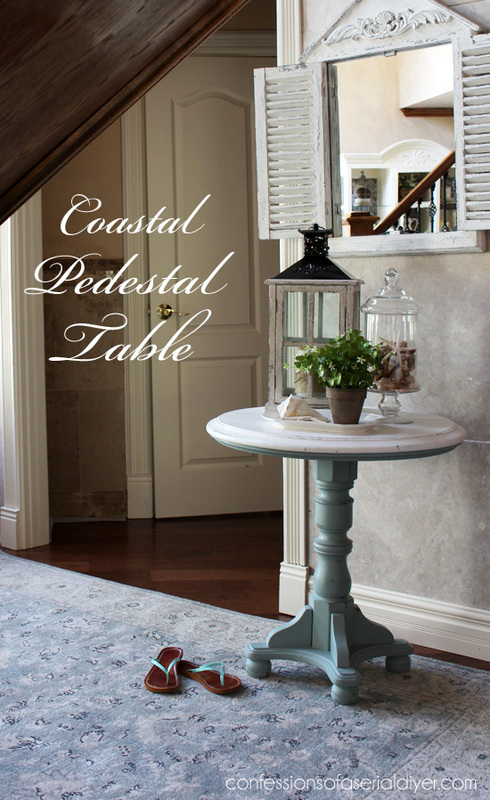 Love your pretty coastal table and it does look perfect under your shutter mirror. Thanks, Marie! I did turn out fine in the end, but why didn’t it tell me hours earlier that it wanted a just a simple paint job lol! 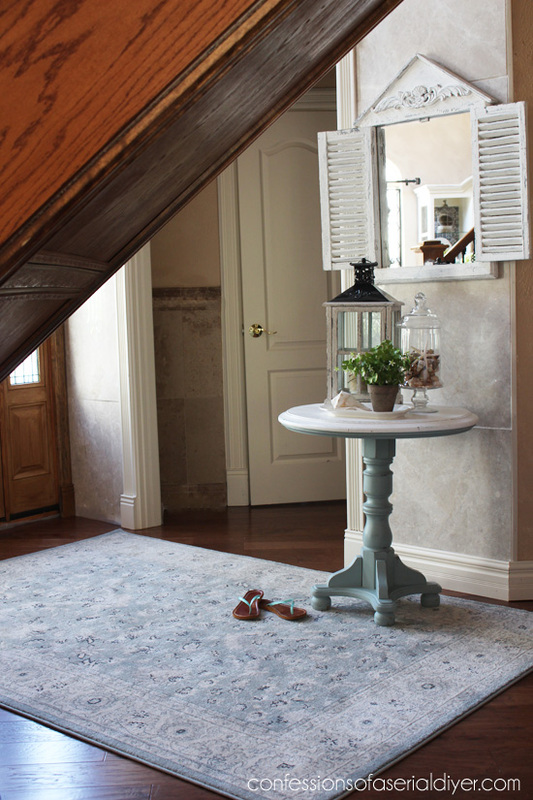 What an awesome makeover Christy…and your new floors look beautiful!! Christy I love the colors you used for this. Beautiful job. Haha. That totally sounds like something I would do – making an hour project into an all day event! I love the way it ended up. Great colors and great piece! Thanks, Angie! Oh my gosh…what a booger this table was ha ha. I should have mentioned that I already had it base painted in the blue and ready to go before I spent all day trying to make it something it didn’t want to be lol! 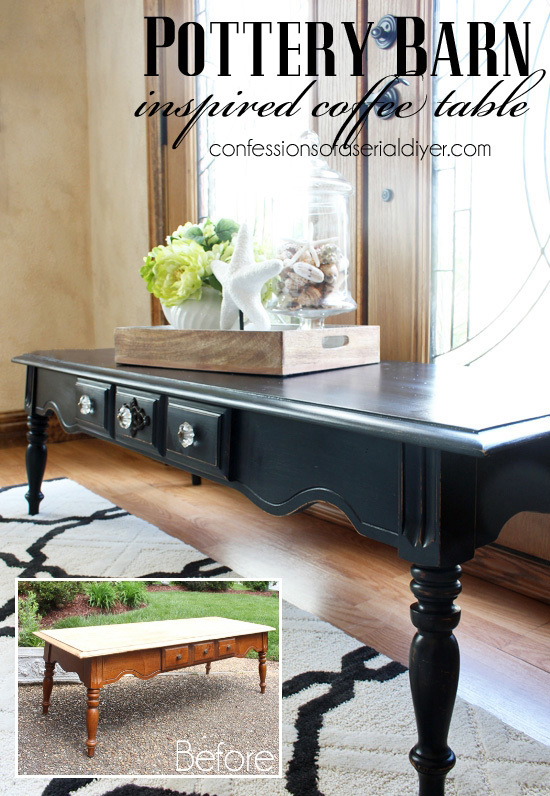 Christy, I love the way the table turned out. I can’t see it looking as beautiful any other way! 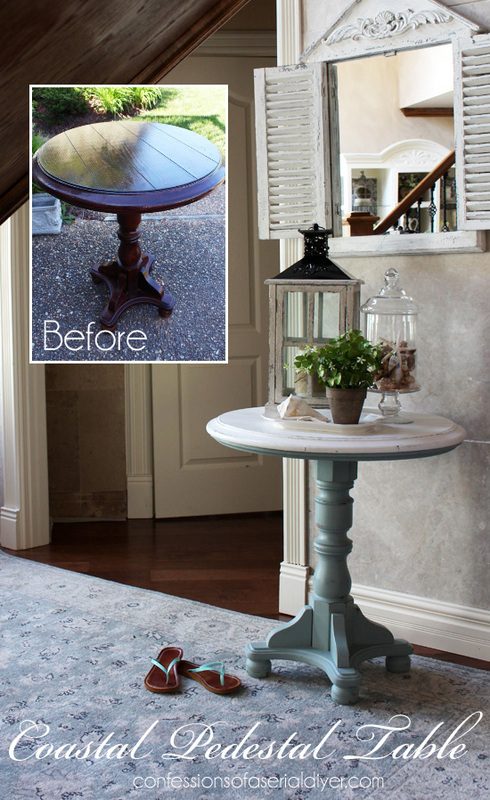 What a fantastic difference between the before and after! Great job, Christy! This turned out so pretty! Love that shade of blue! So glad the clock and stripes didn’t work out because I think it’s perfect…and yes, you should keep it right there! 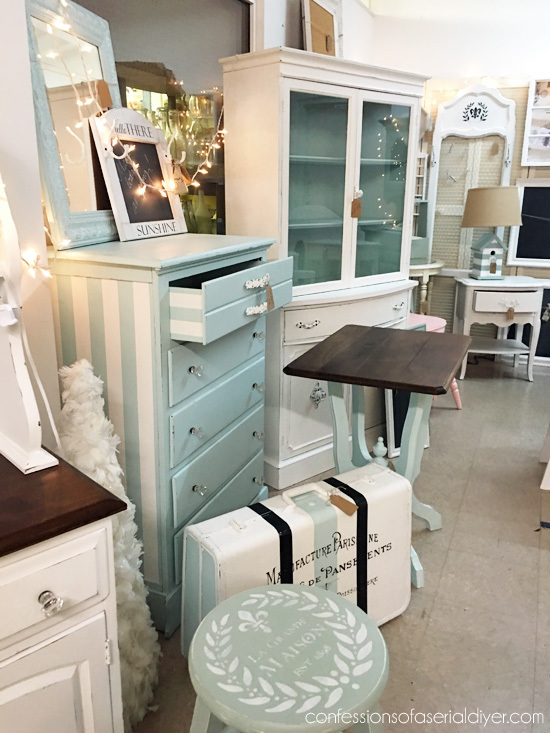 I am in love with that color combo, so pretty and beachy. 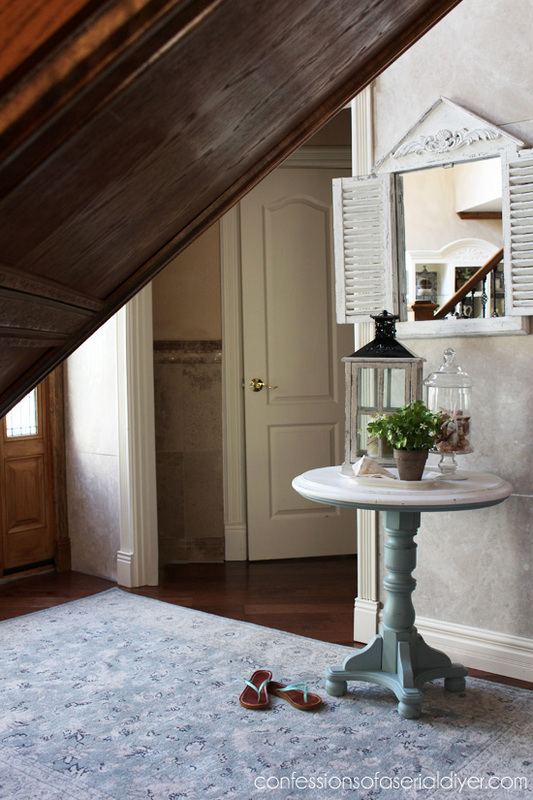 Your floors look amazing!! Can’t wait for the tour. 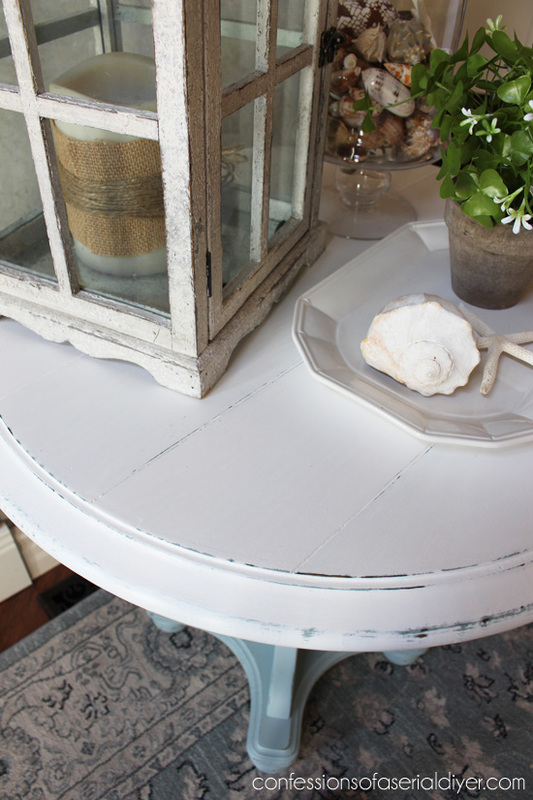 Such a lovely color and table! 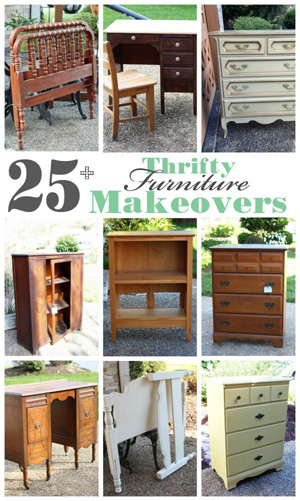 You did it a great service with this makeover! The gray and white are perfect compliments to each other. 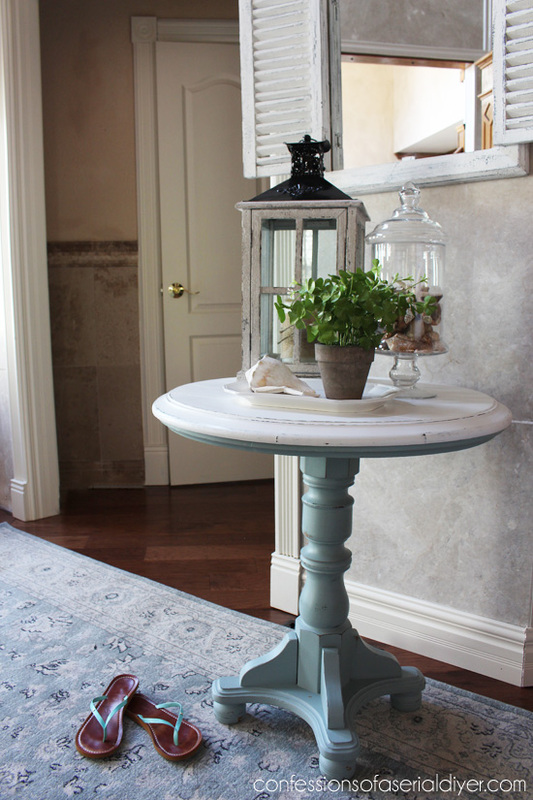 Love the style of the table too. Definitely much more softer and prettier. Great makeover as always, I really enjoy what you come up with!